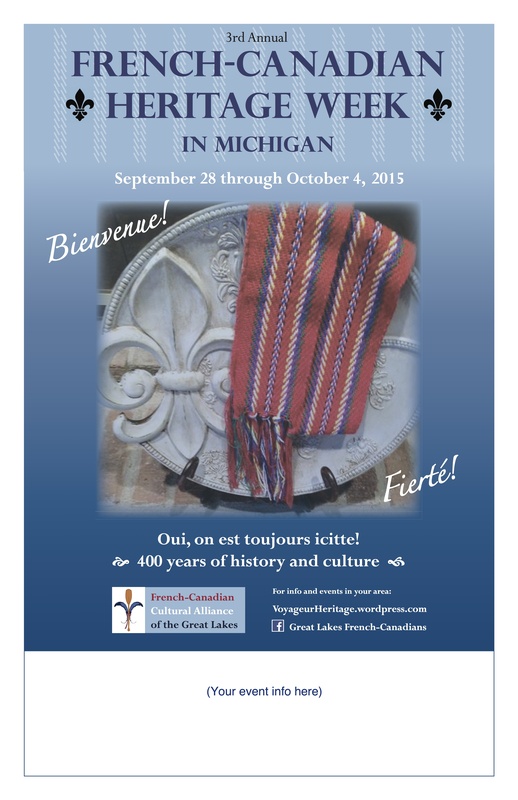 2015 HERITAGE WEEK POSTERS FOR PUBLIC USE – WITH MANY THANKS TO DARLENE DARLEY FOR HER SASH POSTER AND DAWN EVOE-DANOWSKI FOR THE IMAGE OF HER SASH AND FLEUR de LYS. If you are planning an event in your community or for your organization, let us know and we will be happy to help promote it for you on our blog and social media. 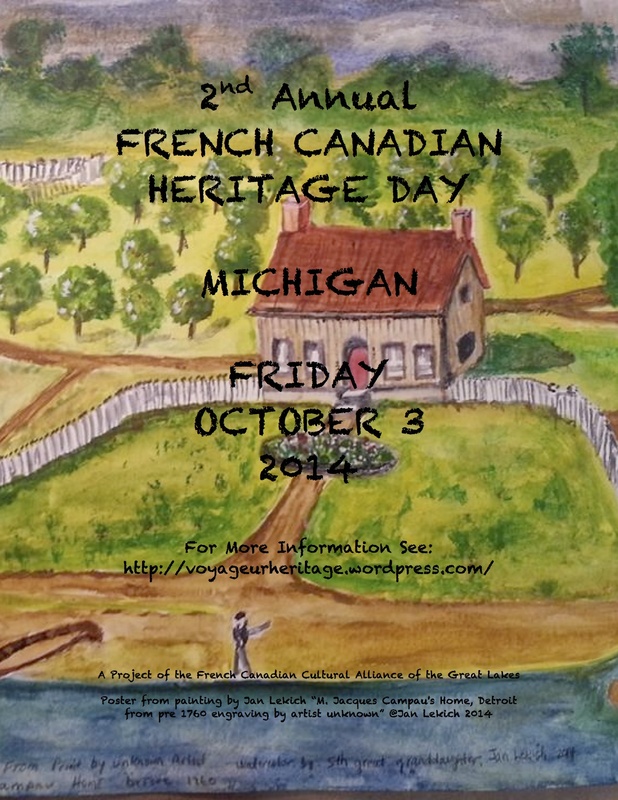 On October 4, 2013, Michigan celebrated its first French Canadian Heritage Day, a tradition borne out of a popular desire to celebrate this culture and formalized by a Resolution in the Michigan House of Representatives. In 2014, legislators decided to extend the ‘day’ to a ‘week’! 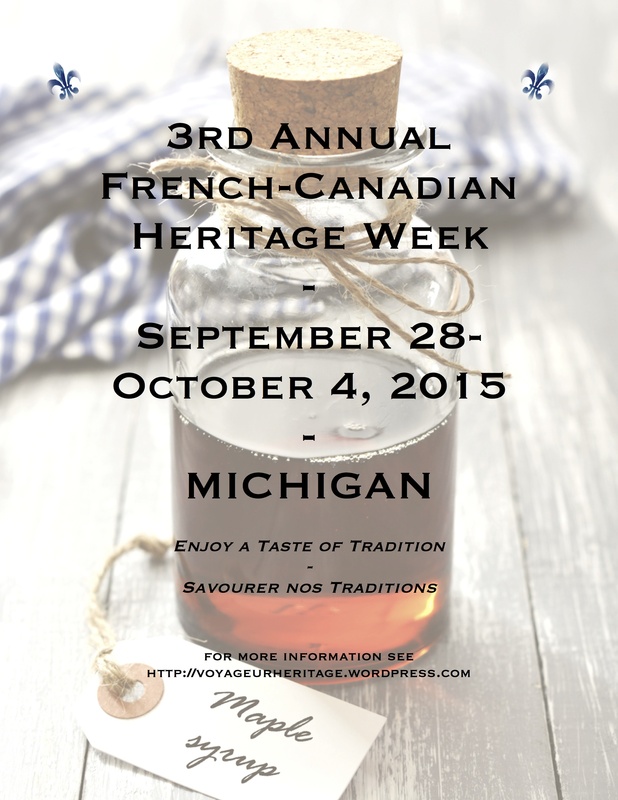 This is a new tradition for Michigan’s French Canadian community, one that will be celebrated at the end of September/early October in the coming years as a way to bring into homes, schools, and communities the traditions and history of our culture. In May 2013 a small group of current and former Michiganders with a shared French Canadian heritage decided to make a difference. After taking part in many discussions about our heritage, after pealing away layers of assimilation and Anglicization, we realized that French Canadian culture in Michigan is more alive, more relevant, and more interesting than conventional wisdom has led many people to believe. We realized however that for many people of French Canadian heritage, their connection to this culture is tenuous at best. For many people it is merely of genealogical interest. For some, claiming French Canadian heritage as a living, breathing culture seems almost…out of bounds. The winds of change have swept away the French language from the Western Great Lakes, with the exception of Ontario and perhaps some remant speakers in Michigan and Minnesota. To be French Canadian means in part, facing a past in which we were transformed from one of the founding cultures of the Great Lakes region – of North America – to an ethnic subculture, categorized in unflattering terms, consigned to historical footnotes. Historians in fact have largely ignored French Canadian culture in the Great Lakes and when they have approached it at all, their conclusions have often been strikingly similar: that French Canadian culture began to die out in the 19th century and what is left is but a remnant of a culture no longer practiced in any real sense. 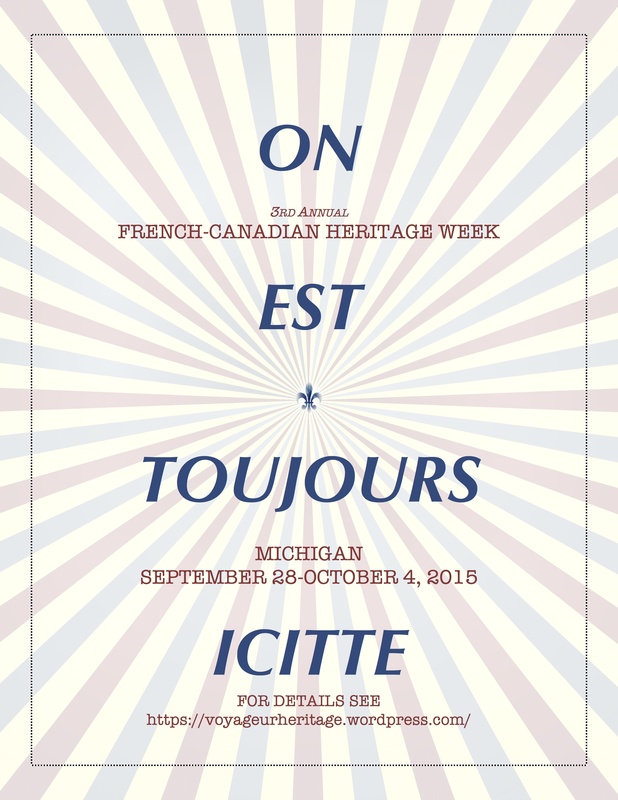 Yet in the past decade or so, some have realized that the historical, and contemporary picture of French Canadian culture in Michigan is not quite that bleak. And we, the Ad Hoc Committee for a French Canadian Heritage Day in Michigan, are evidence of a people not quiet ready to walk off the stage. We are a group, a people, fully aware of our past, of the complicated nature of the Great Lakes fur trade, of intercultural marriage, and the role of religious traditions in shaping our culture. We are fully aware of the birth of a new culture in the distant past that has nonetheless reached us too, in the form of stories formed in oral tradition, a deep respect for our ancestors, culinary traditions, music, and a reverence for the rhythms of life and nature. Many people have asked, why October? Why not St. Anne’s Day or the Feast of St. Jean the Baptist in June, both important days in the French Canadian calendar? While we seriously considered those days, our main objective was to have a day in which as many people as possible could participate. Since Summertime is often filled with family activities and vacation, adding a new, unknown heritage day ran the risk of it being lost in a sea of other important days, like the Fourth of July. October is at the beginning of a series of Fall ‘heritage holidays’ – homecoming, Halloween, and Thanksgiving in addition to harvest home celebrations and hunting seasons make it a season in which thoughts of home and culture are on the minds of many people and form the basis of community celebrations. 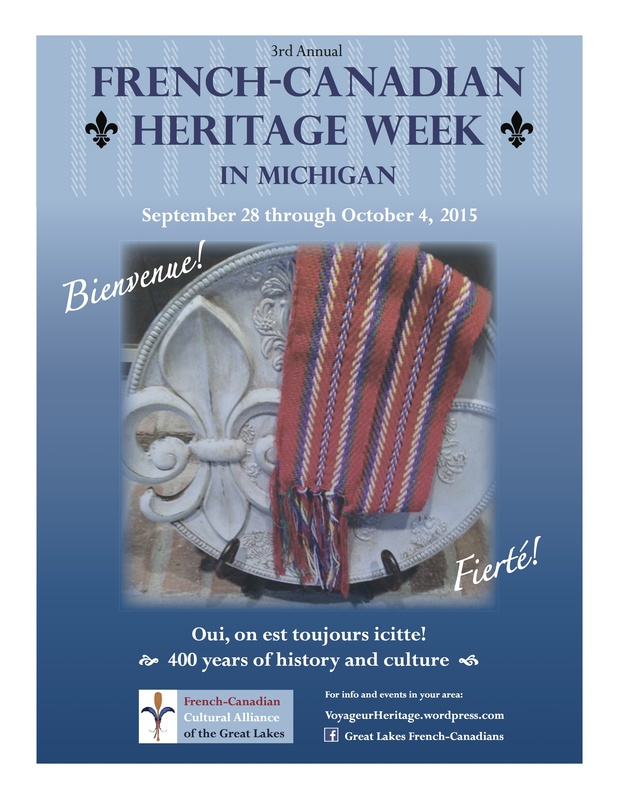 Our goal then is to make French Canadian Heritage Day a part of this rhythm of celebration. There are many opportunities for people of French Canadian heritage to add old/new traditions to their activities, whether it be adding a festive arrow sash to a parade costume, making homey glissants or tourtière a part of their cooking repertoire, or telling a traditional French Canadian tale as part of a trip to a cider mill. And central to our goal is for this day to be incorporated into the curricula of schools around the state, in particular in areas where French Canadians lived in large numbers, such as Southwest Michigan, in the communities along Lake Huron and in the Upper Peninsula. 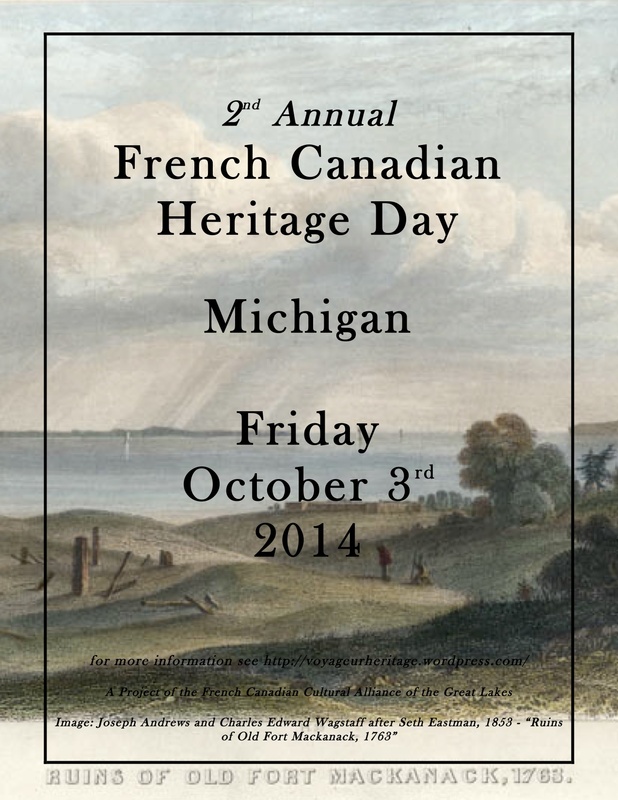 October 4th, 2013, the first Friday of October, was the first French Canadian Heritage Day, a day of celebration for all Michiganders interested in our shared history. When we celebrate the harvest, prepare for the hunt, and give thanks for our rich bounty, we are celebrating most of all the hallowed traditions of our forebears. Now, as French Canadians and Michiganders, we can celebrate the uniqueness of the Great Lakes region by tapping into a heritage centuries in the making.